Human exploration beyond Moon is getting more probable with passing years. The most accessible aim of our future missions is Mars. So far, NASA has chosen 47, so-called exploration zones from which one will be the place of the first step on red planet ground of human mankind. Let me show and describe you one of this area in details on the basis of a created map. Hebrus Valles is positioned on the south border of Utopia Planitia, which in the past was part of the great northern oceans. This is a really impressive place because of canal system eroded by fluxing fluid and collapsed terrain features that created extended cave system. These caves are our hope because many scientists are considering it as a place with higher possibility of water/ice or life existence. 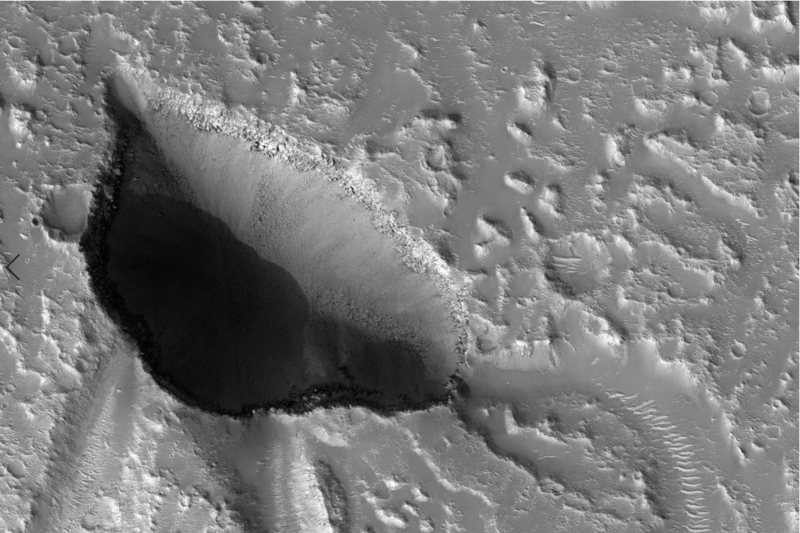 Hebrus Valles area is also rich in enormous and deep craters which could be helpful to geologists who are recreating a planet history. Exploration Zone according to NASA should have 100 km radius which is defined by rover capability (fuel) to travel and return to the central base. Preparing the mission for astronauts, scientists created developed scenarios for what they need to do or where to go. They named essential points that should be placed inside the exploration zone. The problematic task is to investigate the area by remote sensing methods and choose the right, strategical place. RROI (Resource Region of Interests), SROI (Science Regions of Interests) and SR (Special Regions) are these points where astronauts would search for water in all forms, remnants of life in forms of fossils, minerals essential for 3d printers and others. Regions of interests positioned on Hebrus Valles exploration zone area are tightly related to geomorphological features of the terrain and elements identified by Mars orbiters. For example, impact pits are great source of information about geological history of the planet and there are placed some SROIs. Traces of fluid in form of troughs are also assumed as potential SROI and even RROI. Basaltic sands are considered as a resource so it’s also included in essential points. The most interesting on the area of exploration zone are probably SRs positioned mostly near caves where humans could meet live forms. Scientists expect it to be some forms of bacteria or their fossils. NASA created broad plan of how human base on Mars could look like and what structures explorers will need. On Hebrus Valles Map you can find Landing Zones where spaceships will land and start, Habitation Zone where astronaut will live, Greenhouses for plant breeding, Power Zone with solar panels or other energy source and In-Situ Resource Utilization Zone where sources gathered on the planet will be utilized and transferred into useful. It could be converting CO2 to O2 but also salty ice (brine) to fresh water. There are many obstacles that are preventing us from exploration of Mars. Probably the most important is cosmic radiation which is dangerous for future explorers. That’s why they should have something like map to guide them to essential places and help them to make crucial decisions. There won’t be any exaggeration if someone would say that success of the mission depends on a map. This work is a basic start for more extended research which should be done before proper exploration. Full Hebrus Valles Exploration Zone Map is available on website: www.hebrusvalles.com. This study, Hebrus Valles—The Mars Exploration Zone Map, was recently published in the journal Advances in Cartography and GIScience. Currently I'm a geology graduate student looking for a PhD theme related to: cartography/astronomy/quaternary geology/glacial geology.